This May, Shaun Keylock Company will premiere guest choreographer Jordan MacIntosh-Hougham's work Bad! Bad! Bad! Graduating with a B.A. from Bennington College, Jordan has continued their study of hybridizing dance and video, with regard to fostering radical empathy between audience and performer. They have since premiered Bad! Bad! Bad as part of the Bridge Project at Velocity Dance Center (Seattle) in 2018. We caught up with Jordan to find out more about the groundworks of making and restaging this premiere on Shaun Keylock Company. I have danced for as long as I can remember. A teacher came to my studio in Port Angeles, Washington to teach modern, and that was kind of mind blowing for me. After graduating from high school, I took a gap year to take dance classes in Seattle, then went off to Bennington College. I remember taking the first year dance course at Bennington, and everything made so much sense to me. I felt like I was right where I belonged. I was coming in with less experience than a lot of people, but with a really strong sense of what I wanted to do. Bennington taught me to question everything, which I will hold with me for the rest of my life. Is your piece Bad! Bad! Bad! a project that started at Bennington? Loosely. It started as a project for a collaborative dance and video class, where I walked around with a GoPro in one hand, attached through an HDMI cable to a mini projector in the other hand. A character started emerging from this project — I talked in a whisper so people would have to be very close to me to understand what I was saying. I was mostly talking nonsense, but with a level of authority that demanded attention. In retrospect, I realized this was reminiscent of Janet Cardiff’s audio walks. I am inspired by her ability to make you feel like you are stepping into an alternate reality, but are based enough in actual reality for it to be slightly disorienting. How did this character evolve from its beginning stages? After graduating, I had an artists residency at Studio Current (Seattle), where I was able to explore this character more deeply. I started calling her “The Bad Tour Guide,” and that was when I bought her a wig as well. I started actually taking people on “bad” tours: at Studio Current, other people’s parties, even of my own house, which I would pretend to know nothing about. She evolved: She became a little bit louder, and anxiety became more prominent as a base foundation. She is an authority figure without any any authority — a public speaker afraid of the public. She doesn’t know what she is talking about, and doesn’t know what she is doing. I think that is something everyone can relate to, and I want people to find that for themselves in this work. You have worked with film in a lot of your past work. How did the use of film evolve with Bad! Bad! Bad! specifically? I knew I wanted to return to the idea of dance and film that I had been working closely with in my work at Bennington. Sort of inspired by Trisha Brown’s piece If You Couldn’t See Me (1995), where she was faced away from the audience for the entire piece, I was interested in preserving the ability to have movement oriented in 360-degrees while having the audience oriented in a really specific frontal way. The camera can provide insight into magnified intimate moments, facial expressions, and micro-movements, and allows for the power to be bounced back and forth between the video and the body. Your piece Bad! Bad! Bad! uses humor to convey a character or theme. Is your use of comedy in a performance context new for you? That was something that came up for me at Bennington. I created this work called “The Way The Night Comes,” which I didn’t know it was going to be funny. When I performed, and people were laughing, it felt amazing. They were not laughing at me, but were understanding the feeling that I was going through. That was the first time I experienced that, and it felt like what I had been striving for the whole time. Bad! Bad! Bad! is the first piece I have made with the intention of making people laugh. That being said, the work is not just a funny piece — these characters are going through a lot of negative things. There is so much anxiety, imposter syndrome, and trauma in the piece, but the humor aspect invests people in that. How much control do you feel like you have over an audience’s feeling or understanding of a piece? I feel like we don’t have control over the audience at all. I do think that there are ways I can offer an invitation into the work, whether that’s through the use of video, sound, text, or humor, for example; simple gestures that perhaps make people want to invest themselves in my work more deeply. Virtuosity or “tricks” do a lot in terms of audience engagement, but I try to think about them in a different way. How can I build an expectation, and not necessarily defy that expectation completely, but allow for some different kind of satisfying release to happen? I often strive for this because I think it has an impact on people—it has an impact on me. I am always interested in talking to anybody and everybody after they have seen my work, so I can learn more about what people see in it. I really appreciate when people don’t enjoy something. I think that is really valuable and legitimate. What have you learned about the relationship between humor and anxiety as you have worked on Bad! Bad! Bad!? There is an element of performativity at all times. Performing onstage is just an extreme version of what we are doing every day of our lives. Having an audience puts a different kind of pressure on it, and that is what feeds humor for me as a performer. The anxiety and offbeat humor comes from how I feel in my daily life — a little bit of an outsider, doesn’t fit into a box, doesn’t want to conform to a notion of who they should and shouldn’t be — and that is that character. I have found through dance how to see performance anxiety as more of an energy source that can create this whole body sensation. Maybe that sensation is “I can’t find my feet,” but that’s usually okay. I feel like that belongs in the pieces that I make, and the characters I am working with. What are you most excited to see in Shaun Keylock Company’s premiere of Bad! Bad! Bad!? The whole thing! I am excited to see the same piece as an entirely new piece, and to see how a different cast with different characters has developed over the residency. I am curious if it will still be funny. Are people going to laugh? I don’t want that to be the goal because sometimes that doesn’t happen, but I am excited to see how a different cast and different audiences react to the work. I think people should be excited to see a bunch of technically virtuosic dancers make fools out of themselves. 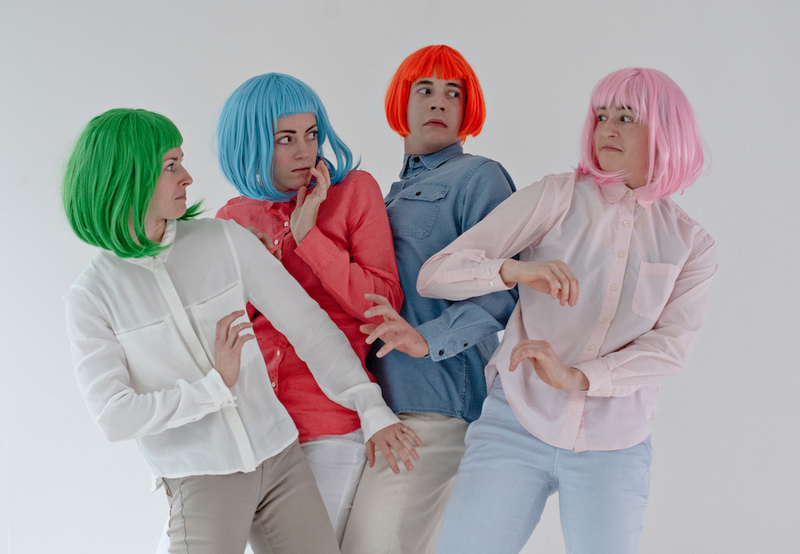 You can see Shaun Keylock Company performing Jordan MacIntosh-Hougham’s new work Bad! Bad! Bad!, along with other world premieres by Josie Moseley and Shaun Keylock this May 10-12, 2019 at New Expressive Works. Click here for more info. LOUISA PARKER IS A STUDENT AT BENNINGTON COLLEGE AND INTERN WITH SHAUN KEYLOCK COMPANY. My name is Louisa Parker and I am a Sophomore at Bennington College studying the connectivity between dance, figure sculpture, and piano, using the groundworks of the body as a catalyst for this exploration. As a sculptor, dancer, and woodshop manager at Bennington, I am invested in construction of and with the body. In my work, I consider how the body can translate movement into 3-dimensional actuality. This study of intermedium translation between the body, sculpture, dance, and piano is one that is becoming increasingly fascinating to me. In my research for Bennington’s winter “Field Work Term,” I reached out to Jordan MacIntosh-Hougham, Bennington alumni and recent Guest Choreographer with Shaun Keylock Company, who directed me to Shaun and his company in Portland, Oregon. Over the seven weeks of the internship with the company, I participated in company rehearsal—learning repertoire and building choreographic sequences for the company’s upcoming full-length show in May. I also aided administratively, assisting with office work and research. With the opportunity to challenge my skill sets on such opposite scopes of work, I was able to set parallels between the ways of thinking that bridge the two fields of administrative and dance work. Choreographic exercises in the studio aided my creative problem solving skills in the office, while time management and analytical thinking in my administrative work served me choreographically. In the studio, I worked with Shaun to build choreographic phrases through varied forms of movement research. It was fascinating working with layered prompts to construct complex phrase material from such simple instruction. In my administrative research, I found residencies and performance opportunities for the company to apply to this coming year. These residencies offer studio space and accommodations for artists to develop and perform new work, which is crucial to the growth of an upcoming company. This research was also extremely valuable for myself as a student intending to pursue dance post-grad. I have a more solidified understanding of what residencies and performance opportunities typically look for, and how to take advantage of their resources under a limited budget. My experience in both ends of this work highlighted the importance that the balance of these skills hold towards the growth and maintenance of a dance company. In addition to my studio and office work, I had the opportunity to interview Jordan on the upcoming premiere of their piece, Bad! Bad! Bad!, restaged for Shaun Keylock Company. Jordan spoke candidly on their study of the audience-performer relationship, which they often focus on in their work. I began thinking more about this incredibly specific dynamic—specifically how a performer can nonverbally communicate with the audience, and give them something that will stay with them once they leave the theater. During the performances that I attended by local companies and artists, I found myself fixated on the sense of humor, and use of tricks, that choreographers apply to their work. The choreographer’s comedic license and use of quick paced, virtuosic movement continued to surface as primary factors determining audience accessibility and choreographic intention. Navigating non-verbal humor is fascinating when considering that such a large percentage of the humor we are exposed to is verbal. Humor dependent on body language is an entirely different entity. I was most drawn to choreography that used humor as a commentary on a broadly understood feeling or condition. This type of humor is globally accessible and relatable to daily tasks, relations, faults, and quips that we run into every day. The use of awkward movements and interactions between dancers can drive a sense of sympathy-driven humor that feels so deeply real. The use of virtuosic movement is another widely used form of speaking to an audience. An audience wants to be moved, and choreographers aim to do that with impressive technical skill. Walking away from a high-energy performance is something that stays with an audience member. Louisa Parker with one of her class sculptures at Bennington College. Humor and impressive technique proved to be the most successful forms of communication between performer and audience in the performances that I attended in Portland. In my dance work at Bennington, I will continue to research ways to move an audience with intentional consideration of impact and meaningful communication of the body. My objective for this internship was to immerse myself into a field that I am becoming increasingly magnetized toward. I am so thankful for the freedom to have been able to fill the roles of administrative assistant, understudy, and choreographic eye, all under the scope of ‘intern.’ I am returning to Bennington with a fuller choreographic toolkit, and a more humble understanding of the work that goes into running and maintaining an independent dance company. I plan to use the research I conducted for Shaun Keylock Company as a launchpad for developing my own artistic work, and help other artists do the same. I am so thankful for the classes, shows, and discussions that challenged me, moved me, and inspired me to continue pursuing work in this field.